Telematics Wire 2015, is a premier exhibition organized by the Telematics Wire Magazine, which publishes news and information on the industry vertical across the world. Yusata participated for the first time exhibiting Automated Driving Test, Driver Behavior App, Vehicle Diagnostic Tool, Usage Based Insurance, Instant Crash Notification, Dispatch Management and YLogApp- GPS vehicle tracking software. 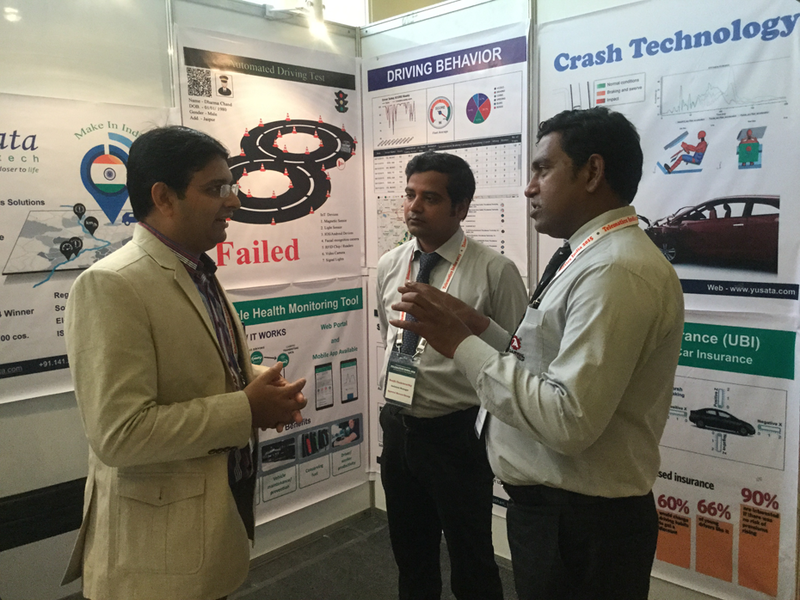 Mr. Rajendra Kataria, MD, Karnataka State Road Transport Corporation visited our booth and had discussed about implementing 360 degree Automated Driving Scenario for their state. He had asked his officials to discuss further and request for a proposal. Mr. Manish Kumar, DIMTS commented, "such concepts are now the need for Indian growth and use of IoT will ensure our progress at International arena". Similar interest in the concept was shown by Officials from Kerala State Transport. We had series of interaction with Sr officials and executives from Bosch, Toyota Motors, Radio Communication System (Ukraine), KHS Institute, CDAC Kerala, SAP INDIA, Hyundai, Maruti Suzuki, WIPRO, HCL, Auto Grade (Dubai), and others in the industry. Official from Larsen & Toubro had serious discussion on utilizing Telematics for their heavy vehicle fleets. We thank the organizers for providing an interactive platform for industry people to discuss and take Telematics ahead in India. We would like to thank our delegates for making their presence at our booth no 32 in Telematics India 2015.